Onam is one of the biggest festivals of India which lasts long for 10 days, celebrated in the Malyali month of Chingam (August-September) in the memories of the homecoming of the King Mahabali. Grand processions, Elaborately adorned Pookalam, delicious Onam sadya, thrilling Snake boat race and unique Kaikottikali dance are a few of the absolute most notable elements of Onam – the crop festival of India. The history and story behind Onam are quite impressive. Mahabali, an upright monarch, ruled Kerala throughout the early era. He had been a kind-hearted ruler who was famous among the people of Kerala. Everyone was happy during his kingdom. The state was free from sorrow, poverty, and melancholy. His fame rose even to paradise, and also Gods become diverted because of his prevalence among the people’s heart and his benefaction. They presume that Mahabali will conquer Gods and rule in heaven. As a result of the stress, they tactic Vishnu for finishing the period of Mahabali. Subsequently, Vishnu took an incarnation of a Brahmin boy named Vamana. Mahabali was the king famous for his benefaction; he always fulfilled the wishes of everyone who arrived at his door for anything. Lord Vishnu’s incarnation Vamana arrived at Mahabali’s kingdom and asked him for three legs of the land from his widely outspread kingdom. Mahabali laughed and agreed instantly. Vamana enhanced his size and covered all the earth with the single foot, and the heaven in the second foot. Later, Vamana asked where to put the third leg then Mahabali offered his head. So Vamana clamped Mahabali to the netherworld with the third leg. However, Mahabali loved the people of his kingdom and asked to visit his kingdom every year as a last wish. So, Onam is celebrated in Kerala in every year to welcome the king Mahabali’s homecoming. 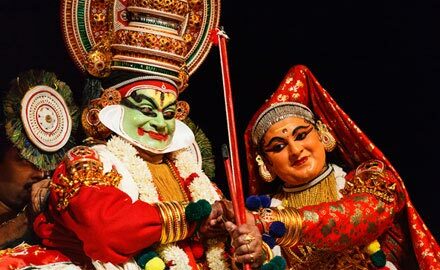 Kerala decorates as a bride during the Onam festival, and a lot of amazing activities also performed in the state during the harvest festival. Some games and sports events also are organized daily with the fun. All these games are jointly called Onakalikal. Some are arduous sports such as Talappanthukali, Kutukutu, and battles such as Kayyankali and Attakalam. Archery also one of the most crucial components of Onakalikal. Elder members of the society play chess and cards to enjoy the occasion of Onam. Lots of outdoor activities carried out for the young women and men who also have the joy onto it although singing classical music. 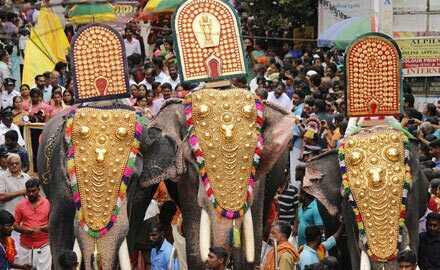 In Thrissur, adorned elephants go out in the procession that pose an imperial style of the harvest festival. Even though at Cheruthuruthy, Kathakali artists create a fantastic environment by their magical performance. Ladies perform their beautiful standard clap dance, Kaikotikalli to subjugate the viewers by the mind-blowing performance. 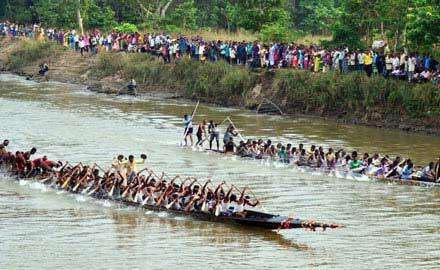 Vallamkali, the most favorite snake boat race, has been additionally organized in lots of regions of the state. The foodstuff could be the best aspect of the harvest festival celebration and offers the ideal prospect for households to come together and relish a hearty meal. There has ever been a convention in Malayalee homeowners to stick to with a ritual that fixed on the Thiruvonam day. Semiya Payasam (Kheer), Beetroot Pachadi, Parippu Chaaru, Mathanga Payasam, Vazhuthananga Theeyal, Palada Pradhaman, Vazhakka Upperi, Pazham Pradhaman are some of the famous recipes cooked on the occasion of Onam. The very first of the Onam celebration is known as Atham also called as Athachamayam festival. People start decorating their household’s courtyard by making Pookalam which is also known as Athapoo that is the highlight of the first day of the Onam festival to welcome King Mahabali. 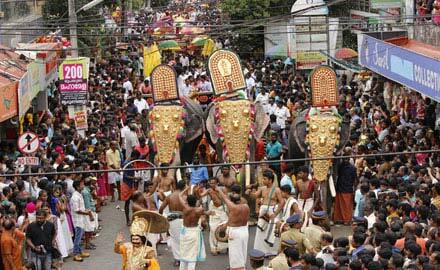 This is the best day to be in Cochin and enjoy the huge procession at Thripunithura in the outskirts of Cochin city. Here one can see the festival parade including all of the folk arts, temple dances, classic art forms of Kerala, flower carpet competition and snake boat race. The second day of the ten-day-long Onam celebrations is known as Chithira. There aren’t any unique or distinct traditions for the day but the devotee offer prayers as always. People start making Pookalam in their household to welcome homecoming of their beloved king Mahabali which increase day by day in size and take an entirely significant extent on the ninth-tenth day of the Onam festival. Chothi is the third day of the ten days last long harvest festival. Lots of various activities make the complete day of a busy day. Markets start getting full as the youngers start their shopping for their dear ones for the next upcoming days of the Onam festival. The size of Pookalam gets more significant than the previous day. 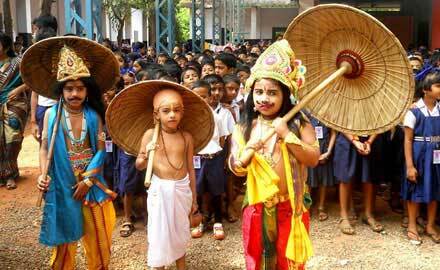 The fourth day of the Onam carnival is known as Vishagam or Visakam. Stirring can be seen easily in the local markets. Women start their preparation for the full food of Onasadya on the last day of the Onam festival which is Thiruvonam. Pookalam also increases a little bit in size as per the previous day. The fifth day of Onam festival is known as Anizham. The main highlight of the fifth day is Vallamkali – the thrilling snake boat race. Lots of famous competitions take place on the banks of the river Pamba on the fifth day of crop festival. A large number of national and global travelers appear to enjoy the vibrant thrill of Vallamkali. The sixth day of the Onam celebration is known as Triketta. Lots of different cultural and social events organized on the day. The size of the Pookalam increases gradually as compared to the previous day. Folks of all religions caste and creed take part in the organized events with full of joy. 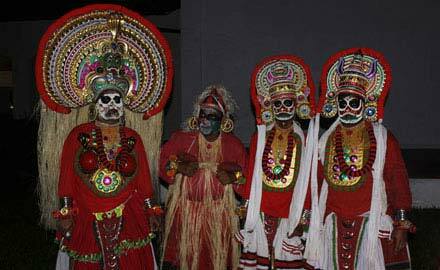 The seventh day of the Onam carnival is known as Moolam. Every street colored with the vibrant colors of the different events and activities. The size of Pookalam also increases a little bit as on the sixth day of the Onam festival. Excited people can be seen in the vibrant market while shopping for the gifts for the loved ones. The Eighth day of the ten days long harvest festival is known as Pooradam holds significant devotional value in Onam festival. Devotees make clay idols in the form of modest pyramids called which are locally known as Ma which well decorated with flowers. One more exciting thing here is as the clay idols made on the day Pooradam, they also well known as Poorada Uttigal. 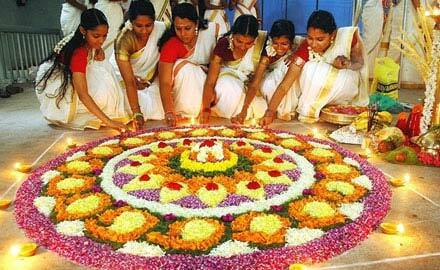 The ninth day of the harvest festival Onam known as Utradam or Uthradam. 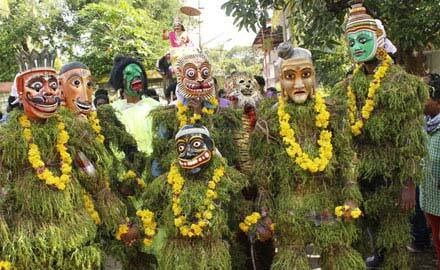 Carnival can be seen all around as the people of Kerala are ready to welcome homecoming of their beloved king Mahabali. Some Folks also mention Utradam as the very first Onam along with the next day Thiru Onam as the second Onam. Finally, the day becomes for which we all are waiting, the day of the homecoming of King Mahabali, the day of grand jubilation, the day to enjoy the delicious Onasadya, Onam. 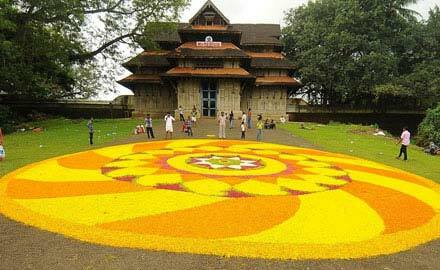 Biggest Pookalam of all the ten days ready to welcome their king Maveli. Pyramids of clay idols representing Lord Vishnu and Mahabali placed in the front of Pookalam. The elder family members bring gifts and new clothes to the rest of the family members. Delicious Onasadya consisted of 10-13 compulsory dishes and served on a banana leaf. In a nutshell, various cultural events, games, dances, shows are the highlights of the day. This is again the best day to be in Cochin and witness Pooram celebration at Trikkakkara village in Vamana Moorthy temple. Here you will see the decorated elephants and the people standing on top of the elephants doing the rituals and magnificent drummers. In the evening, there is also a festival procession in Fort Kochi area. Although Thiruonam is the last day of Onam Festival but for the travelers the excitement awaits in the cultural capital of Kerala – Trissur on Day 11 and Day 12. On Day 11, you will see the stunning Kummattikali procession with elephants and Mahabali etc. 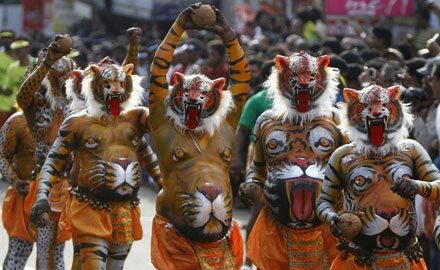 On Day 12, you will be thrilled to watch the tiger dances in the streets of Thrissur known as Pullikkali. 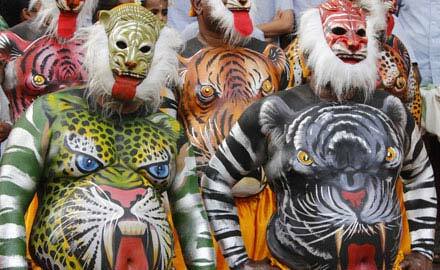 These tiger dances have huge belly all painted with tiger face and pose as roaring tiger. Onasadhya is the yummiest portion of the ten days grand festival, Onam. It’s believed to be entirely the most detailed and comprehensive meal cooked by any culture or civilizations on the planet. Onasadhya is a feast that when tasted for the first time then you will remember it for decades. Book your Kerala tour packages today to taste the same delicious food on your India tour. Onam festival and Snake boat race are now the synonyms for each other. 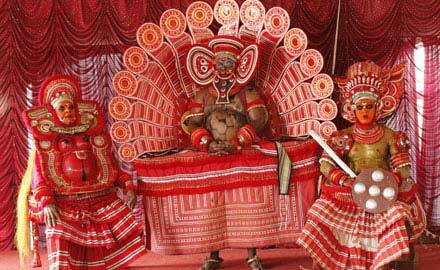 Onam festival seems incomplete without Vallamkali. Pandit Jawahar Lal Nehru, the former prime minister of India, was the first who introduced a trophy for the competition as famous snake boat race. 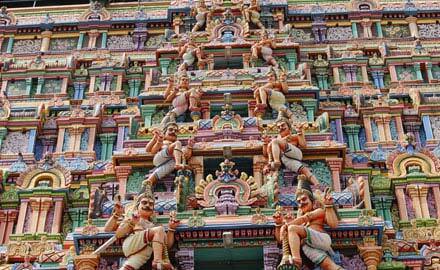 None can miss the thrilling experience of Vallamkali, which stays in your lifelong memories. Snake Boat race got global popularity within a short span of time and drew the attention of a considerable number of travelers. 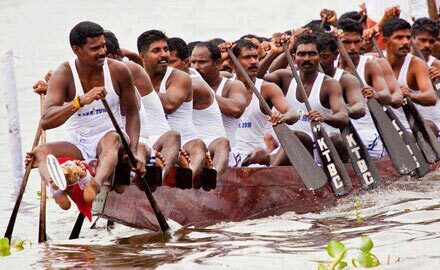 Book South India tour packages to thrill yourself with the boat race. Pookalam can be a complicated and bright sequence of flowers placed on the ground. The custom of adorning Pookalam is exceptionally well known in Kerala and can be portrayed as a pastime in most single household throughout ten-day-long Onam celebration. Excited to feel the real joy of the Onam festival, why not to join HTOI’s Onam festival tour which gives you the best scenery of the ten days long harvest festival of India. Fair and festivals whether it’s Diwali Festival, Pushkar Camel Fair, Kumbh Mela or Holi are the greatest expression of cultural heritage, & tradition. Being an ancient civilisation and diverse country India has a wide array of festival celebration all around the year. You can also enjoy some of the Indian tribal & folk dances and Indian classical dance performances during the festival colors with top India tour packages. Every day there is a festival somewhere in the country. These festival are the best way to explore Indian culture at its best. Being one of best India tour operator we promise once in a lifetime experience to our guests. Keeping in mind we execute many fixed departure tours which include all these famous festivals of India. Check out our India festival tour packages for all upcoming tours. We hope you enjoyed the information shared in this travel trail. Share it with your friends on social media and let them know about this amazing Onam festival of Kerala. 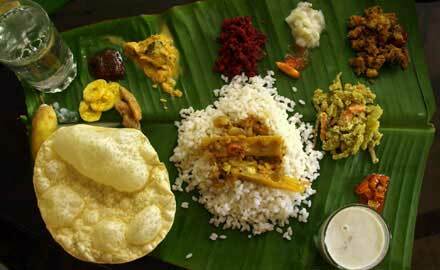 Onam is a greatest festival. But rain and flood this year ruined the celebrations completely. Hope god will be kind next time. Natural disaster are not in our control dear. Hope we will learn from these incidents and be more responsible towards nature. 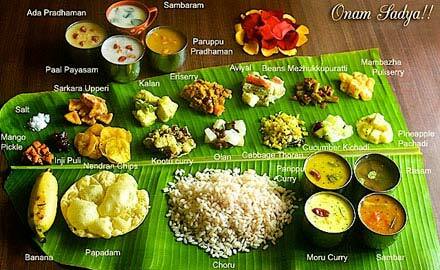 Amazing… This is such a nice and informative onam festival guide. thanks for sharing such a beautiful piece of information.